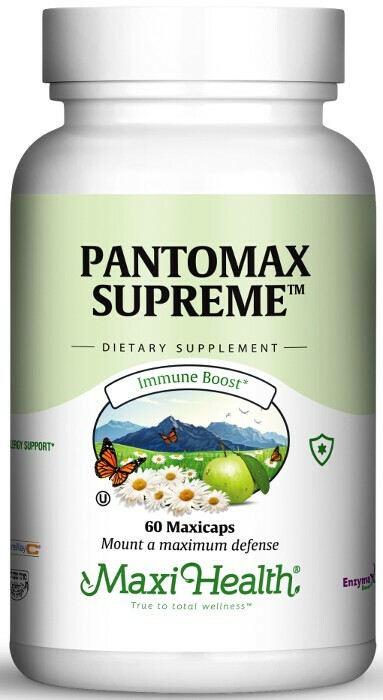 Pantomax Supreme™ combines pantothenic acid (vitamin B5) with Vitamin C, which offers nutritional support for many bodily functions. Pantothenic acid is more commonly known as vitamin B5, its part of the B-complex vitamins. It supports growth, reproduction, the synthesis of lipids, the production of steroids and neurotransmitters, and is a key to energy metabolism. It aids in supporting healthy serum lipid levels, energy, stress management, and stamina. The Vitamin C we use is PureWay-C®. It contains vitamin C-lipid metabolites. It also supports the body’s manufacture of cortisone. This non-acidic form of vitamin C helps maintain the integrity of the connective tissues and to give support for sore muscles, occasional leg cramping, and fatigue. It’s the perfect partner for pantothenic acid! Take one (1) Maxicap™ one to three times daily with meals, or as directed. Other Ingredients: Vegetable cellulose, Enzymax® (calcium carbonate, bromelain, papain, lipase, amylase, protease, silica), vegetable magnesium stearate. This product contains no animal products, wheat, soy, salt, sugar, milk, yeast, gluten, artificial flavors, colorings or preservatives. My sensitivity to pollen has become worse over the last few years. I was given medicines to be taken with a nebulizer and told to use Pulmicort, a steroid. Instead I took Pantomax Supreme. Now I am free of inhailers and other drugs. Maxi Health really does the job for me!